Hemraj, a youth in his mid twenties, hails from Royapuram, in North Chennai, which is a neglected area in terms of development or infrastructure compared to other parts of the city. From street light malfunction to free flow of sewage to handling simple checks by the police, Hemraj says he had no clue how to resolve all them and whom to approach, until he started volunteering with a civic-action group, Arappor Iyakkam. Citizen movements across the city are growing and are becoming a powerful tool to resolve civic issues and what is heartening is that these citizen movements are now being taken seriously by government officials too. “I am just three months into volunteering with Arappor and I have learnt what my rights are. I now educate other people too” says Hemraj who also lists a number of apps like Swachh Bharath and Namma Chennai that can be better utilized to solve issues. 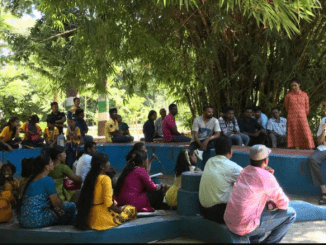 Arappor Iyakkam has paved the way for several other citizen groups to come together to take responsibility for civic and other neighbourhood issues. What started off as a small Facebook group for people living in Chitlappakkam is now a serious movement that has become the window to solve many issues in the area. 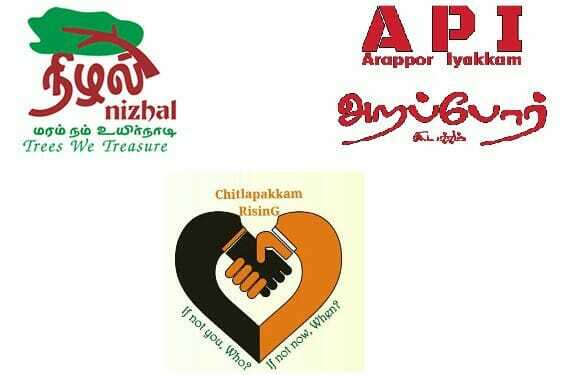 Chitlapakkam Rising now has 5000+ followers and 300 core active members. Sunil Jayaram of the group says “It is our collective responsibility, so we started cleaning the street corners, took wall painting of ugly walls. Residents who saw us bring some meaningful change started participating and we have now grown and are taken seriously when we go with any petition”. 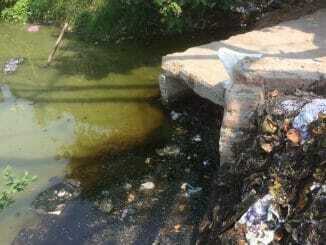 “We came to know about Arappor Iyakkam and take their guidance in matters where they canmhelp. Citizen movements are necessary and authorities now feel that they need to answer us”, says Sunil. Recently Arappor Iyakkam had organised Sakkadai Thiruvizha which saw a high level of participation from residents and associations from across the city. Arappor Iyakkam brought officials from different Government departments to interact and answer the queries of the residents, which was hitherto unheard of. Another movement initiated by the Kalapacheeram Volunteer group specifically works towards a litter-free local Aruvathumoovar festival. It reached out to donors and the public, sensitizing them on food waste and the use of plastics in the distribution of food. 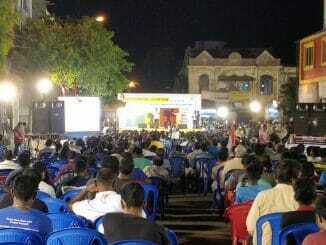 The group sought the support of Chennai Police and the Corporation for planning and logistics support, following which, Mylapore MLA and former DGP Natraj issued a statement, appealing to the citizens and the devotees for supporting the initiative. A year ago, the citizens of Zone 13 came together as a group – aptly called Voice of People – to create a ward manifesto to bring about an awareness on the importance of local body elections and to serve as a local watchdog. The group’s main aim was to ensure that the basic living amenities are in place and residents vote only for councillors who will work for the ward. All was not easy! These citizen movements had to put in considerable effort to not only to gain the attention of citizens and ensure participation but also to garner support from government agencies for the cause they had taken up. Shobha Menon of Nizhal, a group actively involved in greening the city says, “The need to act was marginalized; though people felt the importance of a better environment, getting them to put in sustained work towards a cause is always a challenge.” She feels that though there is a lot more awareness now, there is a long way to as far as wholehearted support from government agencies is concerned. Sunil Jayaram of Chitlapakkam Rising says “When we began work in our locality, people felt this is going to be a one off activity, but when they saw the seriousness with which we were working and saw a visible change, we were able to get more local citizens join us”. Radhakrishnan of Thozhan, an NGO that works for the cause of the less privileged says, “The journey since 2007 has been a roller coaster ride.” He emphasizes that when volunteering for a cause it is important to actually walk the talk. “We need to practice what we preach.” He takes pride in having made a difference in the lives of around 2000 people in his circle. Shobha adds “We want to inspire more people to join us in the green initiative and we make our work speak for it, our tree walks have been a hit among the Chennaiites”. She hopes that the citizen apathy will slowly change to make way for greater involvement. As Radhakrishnan says, every individual should understand the potential to contribute for the betterment of the society. As John F Kennedy famously said “Ask not what your country can do for you, ask what you can do for your country”. Every citizen should be inspired by these words, to take ownership and fight for a cleaner and better living environment. It is the rise of such citizen movements which will help make our city a better living place.